St. Martin Villa - 2 homes in one! Main house with Private Pool and Pool house. 200 Yards to the beach! Emerald Palace ~ Luxurious Beach Home with upscale furnishings and upgrades galore!!! Enjoy an Escape at this Destin Gem! Property Size 2,455 sq. ft. This home is Professionally Managed by Destin Comforts. St. Martin Villa has a special touch of the Caribbean right in the heart of Destin's best beach area. This immaculate beach home is centrally located to everything you want and need and just steps to the Gulf with Pristine waters of the Emerald Coast . 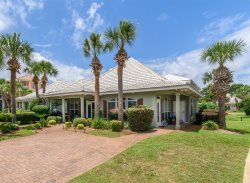 With 5 bedrooms and 4 Full baths, this home has everything you need for a perfectly UNFORGETTABLE Destin Vacation! The home has 2455 sq. feet. The Master suite boasts King bed, Jacuzzi tub, separate shower, dual vanities, and commode room. Walk on out to the huge porch overlooking the pool and enjoy relaxing sunsets! The King Bedroom with on-suite bath on the first floor walks right on out to the pool area. Bedroom #3 is perfect for a family unit with a queen bed, 2 twins and is attached to a full bathroom. This room walks out to the Covered porch overlooking the Beach! On the third floor you will enjoy a bunk area with Full/twin beds, a wet bar and 2 porches, one that overlooks the beach and the other looks over the pool. The Pool Cabana house has a Queen bed, full bath, wet bar and walk-in closet. While this Luxurious home offers a private pool, the fabulous Gated Community of Maravilla also offers 2 swimming pools, one of which is heated in winter months, hot tub, a Work out facility, Tennis, basketball, and private beach access! THIS HOME IS ONLY 750 FEET FROM THE SPARKLING EMERALD GREEN WATERS OF THE GULF OF MEXICO. What more do you need to have the best Vacation ever! Book your fun filled vacation with us today! Keywords: Destin Vacation rental with private pool and beach access. They were very helpful with everything we needed and very quick to respond to questions. 1/3 of total lease payment is due upon booking. The remaining balance is due sixty days prior to your arrival date Our System will automatically charge the credit card on file for remaining balance due on the payment due date.If you would like to pay by Check or use a different credit card please call us before the due date. Remaining balances not received sixty days prior to the arrival date will be considered a cancelation. Destin Comforts of NW Florida, Inc.